Binary Healthcare Materials Management streamlines your consumption-based supply chain management, reducing costly inefficiencies. It also optimizes your supply chain by providing deep control of your requisitions, procurement, fulfillment & consumption processes. Mobile computers scan SKUs primarily in consumption sites to determine whether inventory reaches PAR. If inventory does not reach PAR, the mobile device will prompt the user to request materials, determining by itself whether the inventory will replenish from a central storage facility or outside vendor. These devices improve the accuracy of patient material charges to your billing system, whether it be a stock or non-stock item charges through easy to process issuance. Additionally, mobile devices along with mobile computers can replenish inventory on an ad-hoc basis. Mobile computers also include the capability to print labels with ease from anywhere within the system, including at receiving. With materials management as the second highest cost center for many hospitals and clinics with central stores, effective supply chain management has never been more important. HMM optimizes your supply chain by providing deep control of your requisitions, procurement, fulfillment and consumption processes. Features: Enhanced business intelligence Provides a holistic view of your supply chain Provides the insight needed to efficiently manage, and reduce material costs. HMM will help you get an in-depth look at your financial performance with the ability to track and analyze material expenses by department and by facility. It comes loaded with out-of-the box reporting software such as Stock Turnover, ABC Analysis, and many more to help you monitor your supply chain. The program also helps extend the functionality of GP’s Smartlist builder with added access to healthcare materials fields. HMM controls PAR levels by inventory site, replenishes inventory sites to PAR levels with a single click and can easily export consumption records to Excel to analyze and modify the PAR level of any item. Seamless Integration to Dynamics GP. HMM is built in Dexterity, the native programming language of Dynamics GP. With the same look and feel as you are used to in Dynamics GP, training time is minimized. Flexible Deployment Options. Our products can be deployed on-premise, in a hosted environment or in the cloud as part of Microsoft Dynamics GP ERP. For healthcare organizations operating multiple entities. HMM is fully integrated with Multi-Entity Management (MEM), providing the ability to manage multiple entities in a single database and centralize processes. Integration to our suite of Healthcare products. In addition to MEM, HMM integrates with our full suite of Healthcare products, including National Accounts for Payables and Vendor Contract Pricing and Rebates. Integration with Hospital Information Systems. HMM integrates with many popular Hospital Information Systems, EDI systems and patient billing systems, ensuring all your information systems are aligned and working together. 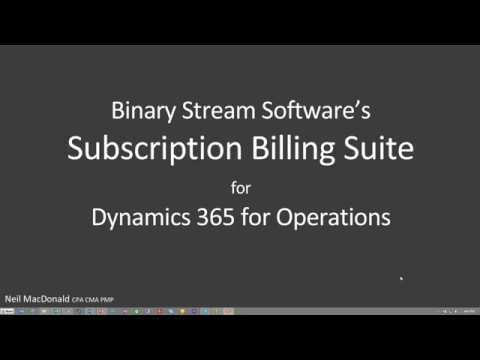 Quick overview of Binary Stream's Subscription Billing for Dynamics 365 for Operation (AX) solution. This product can help simplify the management of Subscription Billing processes.